We’ve arrived at the peak of fall, and much like mold allergies and runny noses, the tumbling leaves and colors of the season are everywhere: the purple maple, the copper oak, the golden-bronze beech. With low gas prices, nature lovers throughout the country will likely be able to escape to the corn mazes or mountains of their local regions, and if you live in the Mid-Atlantic, as I do, you’ll only have to drive a short hundred miles or so to reach the Appalachians. As no vacation or day trip can be enjoyed unless viewed primarily through the lens of a camera, I’d suggest purchasing an expensive digital one to capture the season’s richness. But if you haven’t got that kind of dough, even the camera on your smartphone and a state-of-the-art copy of Photoshop will do. I have to confess that while many thrill to the colors of fall foliage, I enjoy the season’s changes more for the textures revealed. I take pleasure in leaf galls and blisters, decay nibbling at fronds, jagged and smooth blade shapes, luminous or opaque thicknesses. I’m always on the hunt to capture a world of rotten apples, burrs, burls, and mothy invasions. Call it a reaction to living in the age of HD—movie, television, and phone—but I can’t help looking for nature’s jagged edges and snapping stalks. That’s why, when I recently returned from my annual autumn outing to the mountains, I downloaded an accumulated cache of pictures to my computer and immediately converted them to grayscale. In an instant, my silver maples rippled and ruffled, the brown sycamores buckled and cracked, and my red oaks bent and bounced sunlight. 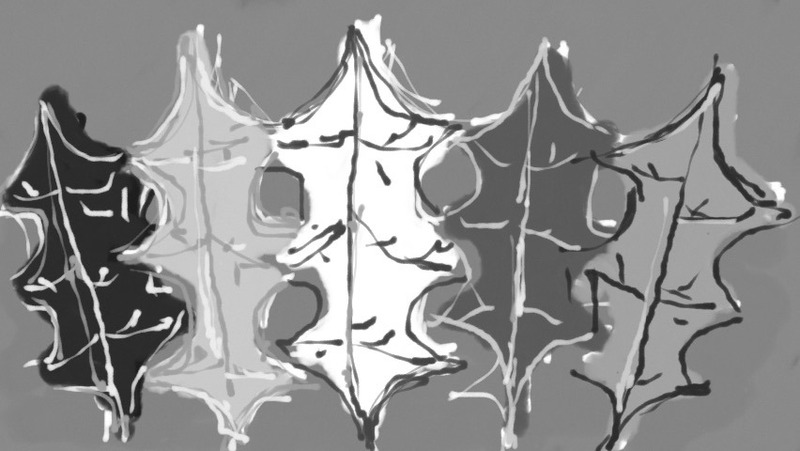 In grayscale, the competing harlequin colors of fall quieted, and undetected leafy shapes and textures were revealed and enhanced. As I pored over the details of those pixelated textures through Photoshop’s zoom, I discovered that an impostor had made his way into several of my shots, a nut-gathering gray squirrel (Sciurus carolinensis). I like squirrels as much as I like any other rodent, but as every serious photographer knows, grayscale photos do nothing for gray squirrels. In such shots, an otherwise noble species fades into the background, and the more I scrutinized this fine varmint, the more I wished for him to step forward. To me his acorn-gathering ritual seemed to sum up everything that needed to be said about nature’s imminent retreat, and I wanted him front and center in my photo so that I might better frame him for placement in my battleship gray-painted trophy room. To get the best picture possible, I returned to my color originals and picked the nut-rummager out of several other photos as well. Zooming into the sections where he appeared, I was pleased to see that my phone camera had captured, along with the sparkle in his black eye and the forceful chomp in his muscled jaw, the full range of his grayness. With no third party coaxing, I printed these shots in color. As most nature lovers and photographers will tell you, only a color image can reveal the full spectrum of a squirrel’s raw grayness and the jaw-dropping luxuriance of this marvelous season. This entry was posted in Science and Technology, Uncategorized and tagged fall foliage, gray squirrel, nature photography. Bookmark the permalink.